Free download ShutMeDown latest version.ShutMeDown is an simple application that will help you automate common system tasks on your computer, such as shutting down, restarting, hibernating and more. It allows you to create automatic timers to make life easier. You can now set shutting down at particular time and see remaining time on graphical indicators. By using SMD you can save electric energy and money by setting appropriate tasks. You can limit time that you and other users spend using your computer with ‘limit tasks’. There is also a schedule that helps you create a plan for the entire week for one or more user profiles. Tasks and schedules can be protected with a password. There are many ways to use all embedded SMD’s features. SMD allows you to create a separate schedule for each day of the week. 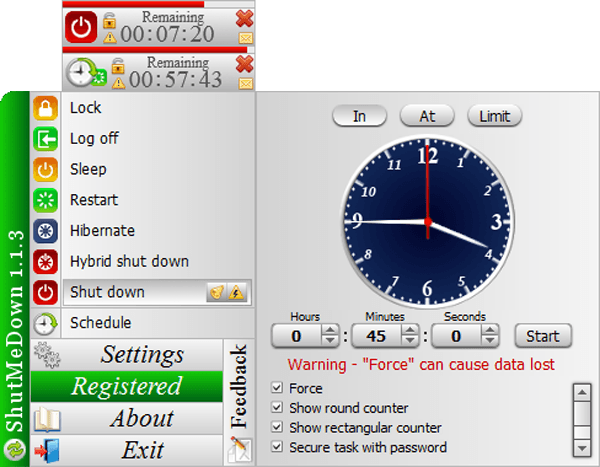 You can control the time spent on your computer, and set the time your computer will sleep, shut down, hibernate and more. In Schedule, you can limit the time a particular user spends using your computer or set a couple of ranges when your computer is going to invoke certain tasks. Every computer user can have their own schedule, that way you can control time your children spend using the computer. Limits set on specific days are remembered even if you log off from your user profile, restart or shutdown PC; next time you log in, time will be counted down again from the last remembered value. Schedule can be paused instead of stopped to not lose its configuration, and restarted again when needed.